Peace vigil & walk this Saturday + Check out our new media page! Saturday 1 March – Peace vigil outside the National Gallery (12.30-1.30pm), followed by peace walk from Trafalgar Square to St Paul’s Cathedral, setting off at 1.30pm. Once we arrive at St Paul’s, we plan to mingle with Occupy London folks, who will be holding their General Assembly on the steps of St Paul’s from 3pm. And check out our new Media page! We have already uploaded some great short vids to this page, including coverage of our Peace Pilgrimage for Syria back in December and a recent interview with Syrian activist Majid Maghout. Saturday 8 March – We will show solidarity with the women of Syria as part of the International Women’s Day march in central London. Further details to follow. Wednesday 12 March – Next Syria Peace and Justice group planning meeting, 6.30pm for 7pm start, until approx. 9pm, London Action Resource Centre, 62 Fieldgate St (corner of Parfett St), Whitechapel, London. 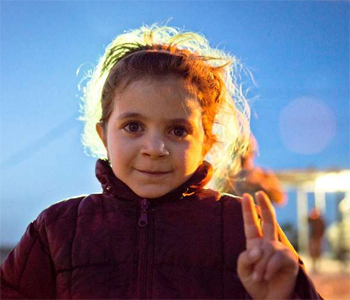 Wednesday 19 March – Info evening and discussion, with short film(s) and panel of Syrian speakers, 6.30pm to 9.30pm, London Action Resource Centre, 62 Fieldgate St (corner of Parfett St), Whitechapel, London. More details of the above events to follow soon, so watch this space! In total there were 11 people who turned out to brave the icy winds and bring a message of peace (in the form of banners and placards) to Trafalgar Square. Despite the weather there were quite a few people around, some of whom offered positive words of support, on one occasion very profusely. A pair of young, female media students came and took photographs of the vigil, and were happy to take a couple of our flyers too. A roller-blader who, much like the one of the buskers during our previous vigil here, seemed to want to monopolise the top tier as his own personal practice space, provided the only tense interaction during the whole two hours that we were present. There was a general consensus that a candlit vigil would not be practical, given the strong winds we were experiencing. Instead, it was agreed that about 6 peace brothers and sisters would undertake an impromptu peace walk to nearby Leicester Square while the remaining 5 maintained the vigil in Trafalgar Square. The group that took part in the peace walk seem to have found it to be a generally positive experience, and when they had returned to the main vigil we formed a circle and shared five minutes of silent reflection for the people in Syria, including the many displaced people currently suffering such extreme cold and hunger in refugee camps. After this our peace brother Earthian kicked off the group meeting, during which we each introduced ourselves and, between shivers, shared our hopes and aspirations for the group, conscious that our own voluntary discomfort was nothing when measured against the unending discomfort of the besieged and displaced population of Syria. at our usual venue, i.e the London Action Resource Centre (LARC), 62 Fieldgate Street (corner of Parfett Street), Whitechapel, London. The agenda is likely to include feedback from our peace vigil in Trafalgar Square last Wednesday and the Syria solidarity conference in London last Saturday, as well as discussing ideas and making plans for future initiatives and activities of the group. I hope you can make it to the meeting. New and old members alike are most welcome. Candlelit Vigil for Peace in Syria + Open Meeting and Discussion. 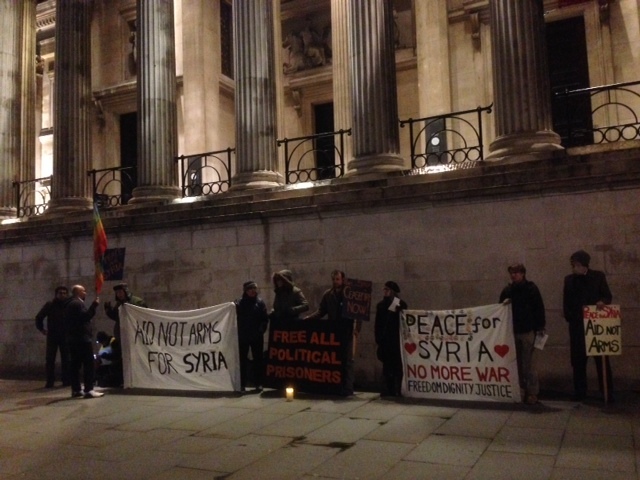 We will be holding our next Peace Vigil in Trafalgar Square to further raise public awareness of the peaceful demands contained in our letter to the world embassies – https://syriapeaceandjustice.wordpress.com/2013/12/10/open-letter-to-all-world-embassies/ – and to encourage a broad and inclusive public debate about how best to achieve them. We acknowledge that to work for peace in the world we must also be able to experience it in ourselves and our relations with others, which is why our vigils are designed with the aim of creating a space for silent reflection that all are invited to enter into. Please assemble from 18:30pm for a 19:00pm start. The vigil itself will last about 15 minutes and be followed by an open group meeting in which all are welcome to share their thoughts about how to take the campaign forward. Feel free to bring candles, banners, warm clothes, hot beverages and lots of good cheer.